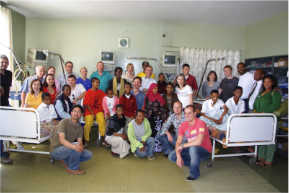 Our third project in the Black Lion Hospital in Addis Ababa was based on the experience we gained during the successful projects in 2004 and 2007. The team is well-coordinated, and the team members have grown into a cooperative and efficient working unit. We have the feeling that the planning and the realization of the operations has become easier. Our team generally remained the same, with a few members being newly recruited from the Braunschweig City Hospital. One important addition this year was the participation of Dr. Birgit Gericke from the Wolfsburg City Hospital. Dr. Gericke is a cardiologist (an internist with specialization in diseases of the heart), and she is able to perform specialized sonographic examinations of the heart (echocardiography). She was able to obtain a mobile high-performance sonographic device for the analysis of heart and heart valve function that could be brought to Ethiopia. In this way it was possible to carry out sonographic examinations during the heart operation, and the result of the operative intervention could be assessed intraoperatively. In addition, the patients who had been treated in 2004 and 2007 could be examined and the heart and valve function of these patients, years after the operation, judged. In 2009 we treated eighteen patients, eight female and ten male. The average age of the patients was 19.5 years, the oldest patients being 28 years of age (one male and one female) and the youngest patient was age 13. The mitral valve (heart valve between the left atrium and the left ventricle) was replaced with an artificial valve in eight patients. In ten patients, two heart valves were replaced. During this trip our team was accompanied by Verena Meyer and Maik Teßmann. Verena Meyer is a professional photographer, and Maik Teßmann is a writer, who brought our thoughts and experiences to paper in a very insightful way. Both of these people had no medical experience and could, through their own perspective, bring to light new aspects of this project. Verena Meyer’s photographs have been displayed in various exhibitions. Several of the photographs are now hanging on the walls of the wards of the Department of Cardiac, Thoracic, and Vascular Surgery in the Braunschweig City Hospital.